I like this course a great deal. Officially (see graph below) the Old course at San Roque is slightly more difficult than the New course. My view is different. I think the New course is genuinely really tough, whereas the Old course is challenging in a refined way. If the New course is like a Ferrari, the Old course is like a Rolls-Royce. The Old course is laid out in what was originally a cork oak plantation. That gives the course its first major feature. Lots of large mature cork oak trees. Some of these are very close to the edges of fairways, so on your 2nd or 3rd shot along a fairway, if offline a bit, you can suddenly find you have a 15 meter tall oak tree to get over on your preferred line. Expect your ball to clatter into quite a few oak trees however well you play. These oaks cast a big shadow and typically have little undergrowth beneath them - just small patches of grass, acorns, broken twigs etc. That, plus extensive mowing, gives the course its second major feature. Very little rough to speak of. If your ball misses a fairway by 5+ meters, you are likely to end up in a grove of oak trees where your best recovery shot off the mostly bare earth may be a 'low flyer'. This is a long course. For me as a mid-handicap player, reaching the green in regulation on the par 4s and 5s was a real challenge. On every long hole I wanted my average drive (around 180 meters) to be a bit longer (around 200 meters). The fairways are narrow (average about 30 meters wide) and have moderate slope (across the fairway). Most fairways are bowl-shaped – a shot slightly missing the fairway up the slope rolls back down onto the fairway. Bunkers are often deep, carefully placed next to greens and also where a drive might slide off the fairway if you do not get the line quite right. Some bunkers are very big – 30 meters or more long. The sand in those bunkers is soft and very consistent. Fine quality bunkers and good to play out of. There are water hazards in play on about 5 holes. Not difficult to avoid, but the safe line will edge you further away from hitting the green in regulation. The course is reasonably flat and definitely walkable, although I would not choose to do so. On a course at this level I want to conserve all my energy for the golf. 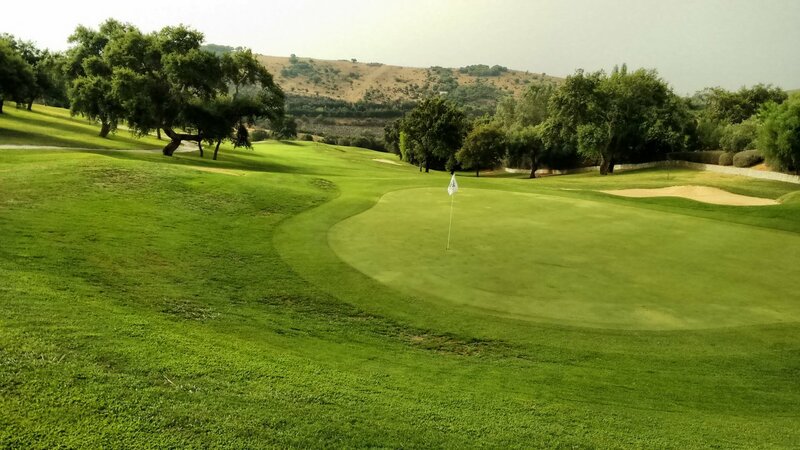 The grass away from the greens was once very high quality – certainly around the time that San Roque hosted major championships in 2005/2006. But now the grass is really not up to the standard of a championship course. In particular there is an invasion of a type of spiky grass from off the fairways into the fairways themselves. San Roque really needs to do something about this long-term. The greens are large and have moderate slope, seldom tiered. They are in excellent condition and very fast. From anywhere on any green if your first putt misses the hole, you are likely to be left with another putt of at least 2 meters coming back at the pin. So the greens at San Roque Old are absolutely championship level and the toughest feature of this course. I thought the green surrounds (a meter or two just off the green) quite soft i.e. easy for a pitch landing there to hold up and not reach the green at all. One forgiving feature of the greens is that they are set down a meter or two in the landscape. So if you miss a green left/back/right, you can hold up on a small hill surrounding the green. I really respect the fundamental design of this course. It does not try to be like any other style of course anywhere in the world that I can think of. I think the mix of easy and difficult features is very interesting. The design makes the best possible use of the landscape and features. This is a uniquely 'Spanish' course – I mean that in the nicest possible way. There are large accurate carved wooden hole maps on each tee. I think this a wonderful course for players up to 25 handicap, and there are definitely enough features there to challenge even players with handicap under 10. The main issue here naturally is cost. As a visiting player, San Roque Old is simply not the sort of course I want to regularly spend money on. 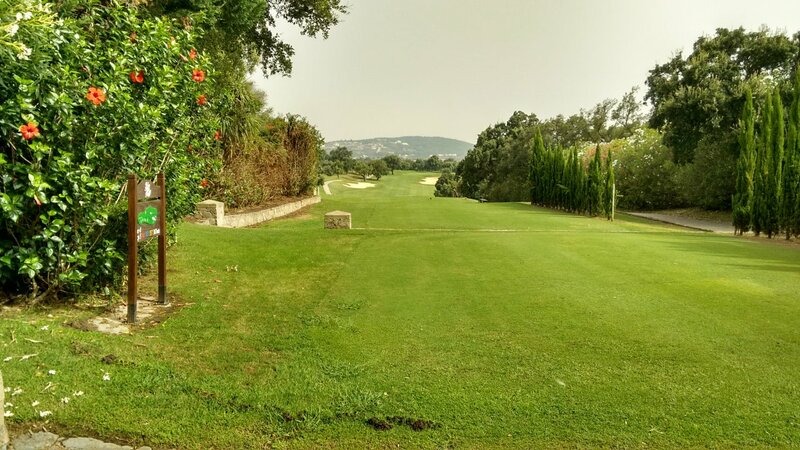 I mostly play courses that cost about 60% of San Roque Old – and get 80% of the enjoyment. But that is just my personal cost/challenge/variety profile given I play a lot of golf on the Costa. 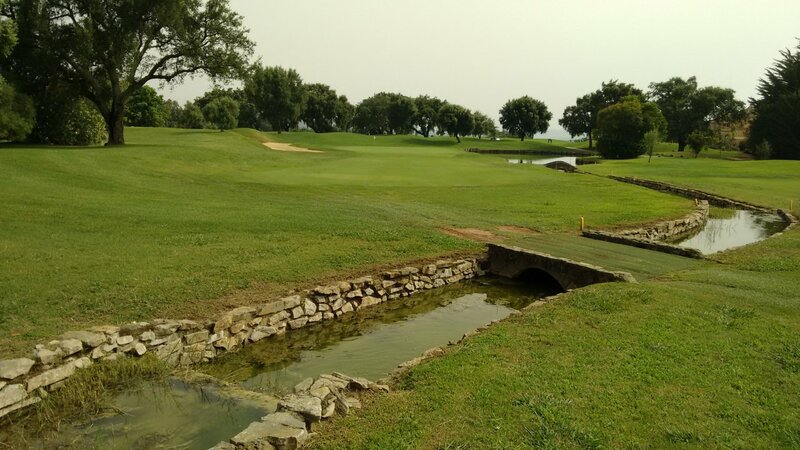 Objectively, San Roque Old is a lovely championship course and definitely worth the money it is going to cost you. However the cost of buggy rental here will be high - €40 or more. But then I think buggy prices on the Costa del Sol golf courses are too high overall. I don't like that sort of pricing – where you get an irritating hit for extras beyond the basic course price. Buggy rental should not be a major profit center (like low-cost airlines that charge absurd prices for 'extras' like luggage and food). Courses want to encourage buggy use – it speeds up the rate of play.